Escape de los bulliciosos zocos y descubra la belleza de la zona rural marroquí en esta excursión de 8 horas en camello y en quad desde Marrakech. Explore el desierto con un guía durante 2 horas de paseo en camello y admire las magníficas vistas sobre el escarpado terreno. Disfrute de un refrescante vaso de té marroquí con una familia local y obtenga una visión de la vida fuera de la bulliciosa ciudad. Después de un tradicional tayín marroquí, suba a bordo de un potente quad y salga disparado por los palmerales. Pase por los pueblos y granjas bereberes tradicionales y, a continuación, vuelva cómodamente a Marrakech. El tour incluye recogida y regreso al hotel desde Marrakech. 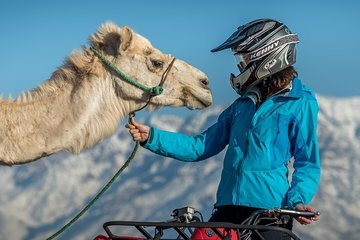 We did the full day Camel and Quad experience. It was exactly what we expected. They picked us up on time at our hotel and took us out to the camels. We enjoyed tea out at a village, which was great to see and experience by a local family. In the afternoon you ride the quads out to the mountains. Momo was our guide on this ride and was very helpful, especially since I was a little nervous riding a quad for the first time. You go back to the same village for lunch for a traditional tagine lunch and it was fabulous. The host is very gracious and the food was authentic and delicious. Much better than I anticipated. I think I liked this part the best of all. The guides take pictures that you can download later. It was a great day. I highly recommend this tour group. You will have so much fun! The camel and ATV rides are both a blast, and the day is broken up by relaxing (and delicious) meals. My husband and I loved the pacing of it.What made the experience especially great though were the guides, photographers, and cooks. They were so welcoming and fun to be around. We immediately wanted to be best friends with Yassin, who gave us an Amazir history lesson, cracked lots of jokes, and taught me a little French. The photographer Zac made us laugh a lot, and K _____ was a great ATV guide. He had fun with us while also keeping us safe and making sure we knew how to handle the ATVs. They speak great English, too!Another thing I loved is that they were very accommodating of my vegetarian diet and nut allergies. They asked about it beforehand via email, and made me a separate taggine from the rest of the group made of carrots, potatoes, tomatoes, squash and olives.This was one of the highlights of our vacation! It’s authentic, approachable, and so fun. What a day! The guides and the photographers were all super amazing. The Moroccan pancakes and tea in the morning were delicious and the lunch was also tasty. On the quad bikes, the guide was great about making sure we felt comfortable. We wanted a digital set of pictures but didn't carry enough cash. The photographer was nice enough to come to our hotel later to coordinate us getting the digital file. It was very focused on being a tourist but they made it fun. There was only about an hour and a half of camel riding and only about an hour and a half on an ATV. There was a lot of wasted time sitting around. The description advertises going to see a Berber village and Riding ATVs into the mountains, but that is completely not accurate. Zakariae was a great Quad leader! He was patient to teach me how to ride the quad and I had a blast! Great tour, Camel ride was a little bit slow but the stop for lunch and tea were great and the Quad Bike was simply awesome! The camel ride was a bit boring and we probably could have done without it, but the quads were awesome. It’s about a 40km ride on the quads around the mountains and through the desert terrain. Again, skip the camels which takes 30 minutes and is really just a photo op. Great tour otherwise! The quad-biking was great fun, I know that some smart arses know it all, but listening to the instructors advice, they know the desert and terrain, made for a really enjoyable ride through some varied landscapes. Both stops in the Berber villages were fascinating and the locals went out of their way to be hospitable, even showing us their homes. Special thanks to Mo-Mo for his unbridled enthusiasm and smile on the bikes, Hissan for the richly entertaining camel ride, and the local Berber gentleman and his children who provided lunch - what a marvellous sense of fun and humour they had! All of which led to a highly memorable day. Had a wonderful time and Ishmail really had a lot of info to share! Enjoyed my time with him as much as the sites!